Gaslighting. Kristin Snowden details how to uncover and overcome emotionally abusive Gaslighting behavior. Kristin Snowden discusses Gaslighting as a form of relational trauma. Her video hopes to help people identify how this Emotionally Abusive Behavior can be uncovered and overcome. Long term exposure to relational trauma could lead to the development of Depression, Anxiety Disorders, PTSD and Complex PTSD. Click on this Link to visit Kristin Snowden’s website. Yes, this is a long video, but Kristin knows what she is talking about. I believe it is very informative and well worth watching. Kristin Snowden is an experienced Licensed Therapist. Individual, Couples, and Family Therapy Treating Addiction Recovery, Relationships, Intimacy, Betrayal Trauma (Infidelity), Divorce Recovery, and Family Issues. Wendy Behary discusses strategies to help one deal with Narcissists. Wendy Behary discusses strategies to help one deal with Narcissists. Wendy has more than two decades experience treating clients, training professionals and supervising psychotherapists. She is one of the founders of The Cognitive Therapy Center of New Jersey. 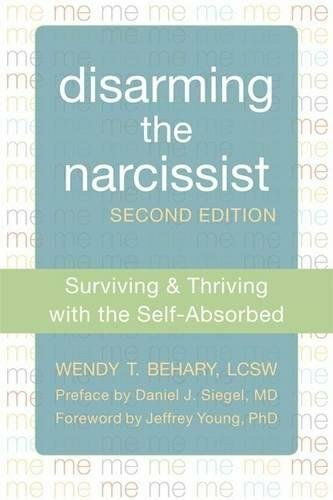 Click on the following link to visit amazon.com to view the book “Disarming the Narcissist: Surviving and Thriving with the Self-Absorbed”. One important point which Wendy Behary makes (around the 35:45 minute mark) is to set limits and boundaries and she has suggestions on how to do that. 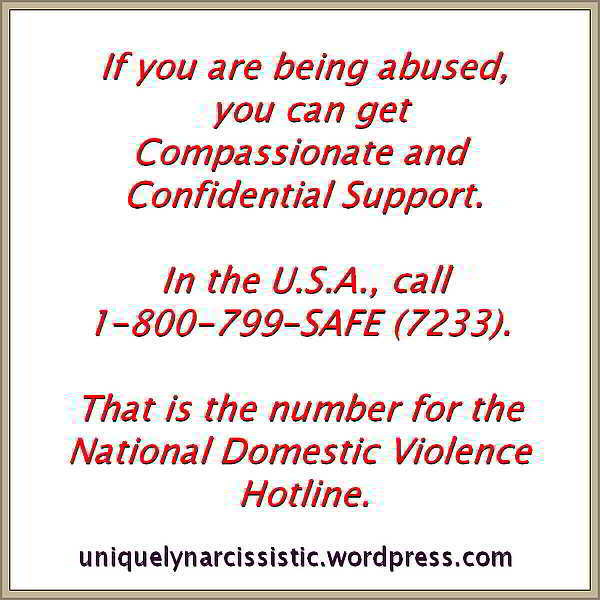 One way is to limit your exposure to the Narcissist, by having limited to no contact with the Disordered Individual. In a work environment, if you do limit the Narcissist’s access to you then watch for the Narcissist moving into Back Stabbing and Smear Campaign mode. When you stop providing Narcissistic Supply, a Narcissist could work to get you fired and or destroy your reputation. Click on this Link to visit the http://psychotherapyjournal.org site with a post featuring another interview with Wendy Behary. Along with a video they have posted a written PDF transcript which you can download and read by clicking on their PDF link at the top of their screen Transcript. It gives one some insight how a 3rd party such as a Therapist might view a Narcissist’s behaviour. IMHO well worth downloading and reading their PDF Transcript. Our Source – Found this post on https://undeniablysara.com and used Press This to post it here. Thanks go out to undeniablysara.com for sharing this. Below is the direct link just in case the above link does not work due to Browser issues. after experiencing Narcissistic or other abuse. Click on this line to visit the Psychologist Locator, a service of the American Psychological Association Practice Organization. The Psychologist Locator makes it easy for you to find practicing psychologists in your local area. Click on this line to visit the Psychology Today website service which can help you find detailed professional listings for Psychologists, Psychiatrists, Therapists, Counselors, Group Therapy and Treatment Centers in the United States and Canada. Click on this line to visit the Skype Therapies website service called Skype Therapist Directory, which provides a list of verified Clinicians who are registered with UK and European Official Bodies. Click on this line to visit the Psychology.com website to use their directory to find Licensed Therapists with assorted Specialties. For our visitors from Australia, click on this line to visit the Australian Psychological Society website which has a searchable Directory of Psychologists in different areas of Australia. The above is our disclaimer for this site. No it is not cold and uncaring. To try and do otherwise would be cold and uncaring and would be a disservice to you. Please seek out a Medical Professional to help you with a situation or problem which you might be facing. Direct one on one help, provided by a knowledgeable Health Care Professional is the proper way to get help and or treatment and support. It was heart breaking reading an email of what you are experiencing. I see this site as being like a database of the Red Flags and Tells to look for, hopefully before becoming entangled with a Narcissist. Once caught in a Narcissist’s Web, it becomes a very different story. 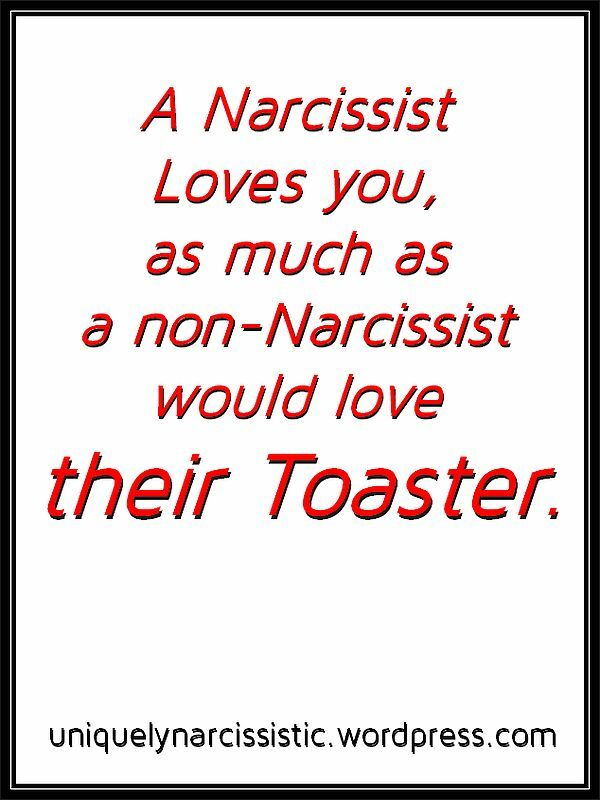 Spending years with a Narcissist, takes things to an entirely higher level. Honestly, please seek out a Medical Professional to help you with the situation or problem which you are facing. Direct one on one help, provided by a knowledgeable Health Care Professional is the proper and best way to get help, treatment and support.